Have you ever wondered who the vaccine police are? Who gets to decide who gets what vaccines children get and when? In human medicine, we have the Center for Disease Control (CDC). This is a government agency, part of the Department of Health and Human Services, and is charged with dealing with public health issues. The CDC is advised by the Advisory Committee on Immunization Practices (ACIP), which is a panel of 15 experts who have been selected by the Secretary of the U. S. Department of Health and Human Services to provide advice and guidance to the Secretary, the Assistant Secretary for Health, and the Centers for Disease Control and Prevention (CDC) on the control of vaccine-preventable diseases. The Committee develops written recommendations for the routine administration of vaccines to children and adults in the civilian population; recommendations include age for vaccine administration number of doses and dosing interval, and precautions and contraindications. These recommendations are considered the gold standard, and they change frequently to reflect our best current understanding of the science of vaccination. Pediatricians get the current copy of the ACIP report, and that's that. You can see examples here. Each practitioner did his or her own thing when it came to vaccinating dogs and cats, and to make matters worse there wasn't much in the way of scientific research to base these judgments on. There is no veterinary ACIP, and the CDC could care less about dog vaccinations. The only guidelines came from the vaccine manufacturers, and when you think about this, the manufacturers are probably not the best source of unbiased fact on how dogs and cats should be vaccinated. So, Veterinarians have been designing their own vaccination protocols for decades. It turns out that there are better and safer ways to vaccinate dogs and cats than we have been using. Based on this research, two professional organizations have published the first veterinary vaccination guidelines. The American Association of Feline Practitioners (AAFP for short) is a nationally-recognized association of veterinarians who specialize in cats only. The AAFP vaccination guidelines are considered the standard of practice for cats. The American Animal Hospital Association (AAHA for short) is an organization that accredits veterinary hospitals and clinics. They have published a number of guidelines and standards of practice on such topics as pain control, dentistry, and now the AAHA dog vaccination guidelines are considered the standard of practice for dogs. These standards have been adopted by every Collage of Veterinary Medicine in North America. 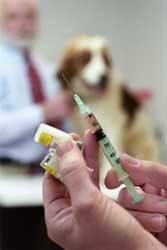 For dogs, it is now clear that yearly vaccination for certain diseases is unnecessary. Recent research has shown that immunity will last at least three years to these certain diseases, which include parvo, distemper and rabies. Given the relatively high incidence of vaccine reactions in dogs, fewer vaccines are better. However, it is important to note that there are still diseases that your dog will probably need to be vaccinated for on a yearly basis. Bordetella, parainfluenza, and leptospirosis are in my opinion definitely worth vaccinating for, and this will still need to be done on a yearly basis. Another new thing is that it is clear that for bordetella and parainfluenza, the intranasal vaccines are much more effective than the injected versions. The vaccine is not injected, rather it is squirted up the dog's nose. This mimics natural exposure, and stimulates both circulating and surface immunity to these diseases. For cats as well, immunity for certain diseases lasts longer than one year. In particular, Distemper, Viral Rhinotracheitis, and Calicivirus need only be boosted every three years rather than yearly as previously believed. And more importantly, certain types of vaccines themselves have been tied to a deadly form of cancer called Vaccine-Associated Sarcomas. While uncommon, (the incidence is estimated at somewhere between 1 in 1000 to 1 in 10,000), the tumors are very malignant and are often fatal. Adjuvants are compounds added to vaccines to stimulate the immune system. Not all vaccines have adjuvants in them, and by choosing to use non-adjuvanted vaccines, the risk of vaccine-associated sarcomas is greatly reduced. Non-adjuvanted vaccines cost a bit more, and the non-adjuvanted Rabies vaccine must be given every year rather than every three years, but the trade-off is increased safety. For Puppies and Kittens, not much has changed. Puppies and kittens both need a series of vaccinations every three to four weeks starting at 8 weeks of age and not ending until at least 16 weeks. Both puppies and kittens need a full set of boosters one year after the first series. The New Protocols are a little too complicated to explain concisely on a webpage. The AAHA guidelines, for instance, are 28 pages long. If you like, we can discuss the particulars during the vaccination visit. And let's not forget the huge value found in the yearly examination. Dogs age seven dog years every one people year, and the veterinarian's annual examination can be a real blessing to your dog by allowing us to identify and treat problems early. I'm terrible about going to the doctor myself, but even I see my physician once every seven years! Cats too age seven cat years for every people year, and the annual exam can really help cats live longer, happier lives. The bottom line here is that there has been some new research that shows that we need to start using different vaccines at different intervals in our dogs and cats. We now have written guidelines, established by the AAFP and AAHA, which have been adopted by every College of Veterinary Medicine in North America and are widely considered to be the new standard of practice. The annual physical exam remains the most important instrument in the veterinarian's hands for helping your pet line a long and healthy life.